When it comes to blogging it’s great to have a plan but not everything can or will go to plan. Sometimes you have to deviate from your plan altogether just to make a setting or scene work. That’s definitely where I landed in the case with this blog entry because the outfit came along alright but trying to find the right setup to work as a background of my scene. It wasn’t until I ended up seeing that ReveObscura had a dollarbie (a term that not many people know or use at all on the grid today so hooray for being a bit long in the tooth) that I came up with the idea for what I wanted to do. The pose is more geared towards female use but I tend to work outside the box with poses and get them to work in my favor. So “Baddie” is a pose depicting the user holding and counting money and I that gave me the idea to shoot it as if I were a underground fight ring organizer that takes bet money and pays the winning fighters (not well because well we’ve never seen that happen EVER). A while ago I played the Bad Unicorn “Fight Night” Gacha and managed to score one of the RARE items which is an 8 Sided Cage (otherwise known to many MMA fans as an Octagon). Once I got myself positioned right in front of the cage I went to work and started taking photos. The main “story” photo that you see above is kind of in between fights while the organizer deals with his cash and gets ready to start the next bout. I have a little bit of a spotlight looking in on him at that moment but I would say that it probably whirls around the cage like you would see during the televised fights. The one thing after I finished it is that it looks just a tad washed out in places but makes sense with the light shining down right on him. 7mad;Ravens is a brand I enjoy as a lot of their work appeals to my style; it just so happens that they are back with a new release at the March round of TMD. While I was roaming around I came across the Split-Tank (Splash is the version worn here). There were a few other designs that were high candidates to make this blog but I narrowed it down to three and then finally to one. This release is fitted for Signature (both Gianni and Giralt) so for those of you with those bodies can take a trip to The Men’s Department and give this tanktop and all of its designs a closer look. Skin Fair 2018 is upon us and I’m getting right into it with one of the releases from Go&See. 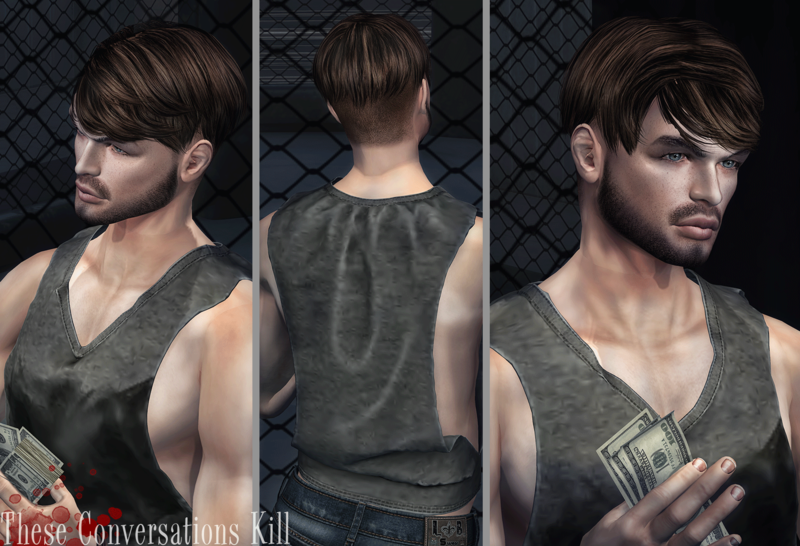 “Danny” is available in Goth, Pale (as seen above), Summer, Tan and Dark Tan with all new body appliers via an Omega compatible HUD (which you can get at Skin Fair as well). A shape and eyebrow shape are included in the box so you can look as the product is intended or you can go your own way with your own shape and eyebrows as well. Worrying about hair was not a problem for me because I knew exactly what I wanted and with the help of my brand partner, Modulus, I used the “Harvey” hair to make the look come more into its own. This was an event release but things kinda hit a speed bump for me so I’m getting this out as it is now in store and is new to the store. If those of you missed the event it was at you’ll be able to get your hands on it as it is a nicely done hair. I guess you could say that it is kind of a longer length bowl cut (if I’m wrong correct me I don’t mind). There are 25 different tones distributed through 5 different color packs (or get them all in a FATPACK for a better value if you can’t pick just one). Of course you could use the color picker in the HUDs to create more than 25 colors so why not get creative! 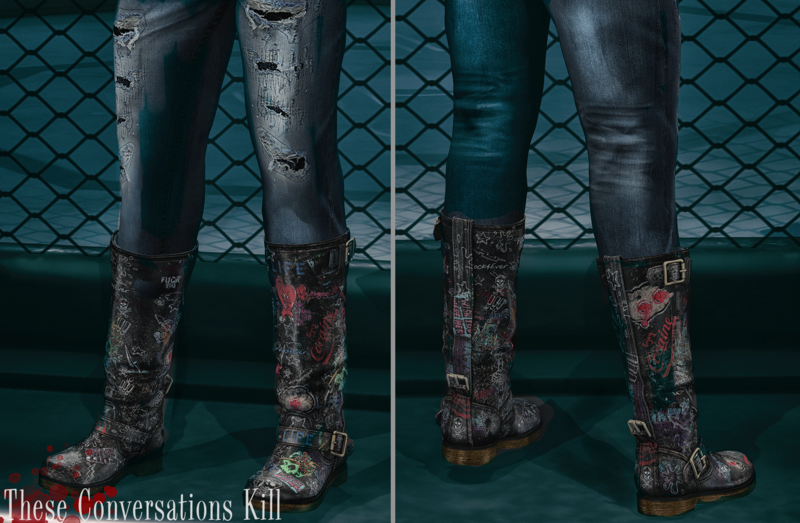 There’s a double does of L&B Swear for this look as I combined the “Destruction Jeans” and the “Salvage Engineer Boots” together to give myself a bit of a raver/punk look as a fight organizer. The jeans have a tucked option to work with the boots as it was intended (for those of you who might have an earlier version of the jeans there is a re-delivery box in your product folder you can wear to get the updated version sent to you). As you can see the boots themselves have a unique design (but this is only one of many different styles that they can be worn in, solid colors are also included in the HUD). A shorter boot version is available with the product that has socks (which can be turned on or off and even given different color styles too) giving these some longevity in your wardrobe space. Time for me to wrap this up but I really enjoyed putting this together and be sure to check out Skin Fair which is now open and runs through the 26th of March so all of you can go get your skin, head, makeup and tattoo fixes on because you know you can’t live without taking a peek to see what is there! More coverage of this event to come on these pages so keep your eyes peeled.